Nigerian Navy authorities in Warri, Delta, on Wednesday said navy personnel in the area had impounded 26 high speed boats in the area. The Operations Officer of NNS DELTA, Warri, Commander Shehu Tasiu, disclosed this to newsmen while displaying the boats at the Naval Base, Warri. Tasiu said that the boats were apprehended on Tuesday at various jetties in the area. 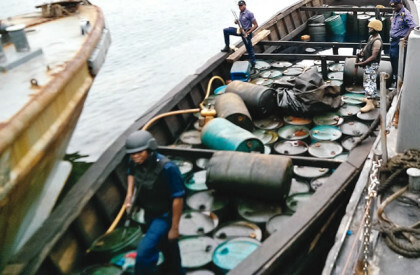 He said the action was in line with the decision of the authorities to rid the waterways of criminality, including crude oil theft and piracy. The News Agency of Nigeria (NAN) recalls that a Joint Task Force in January, banned the use of 200 horsepower and above outboard engines on boats as measure to curtail crime in the creeks. ”The NNS DELTA at various jetties and take-off points in Warri on Tuesday arrested 26 speed boats, fitted with 200 or more horsepower engines and docked them at the Warri naval base. “Those who engaged in criminal activities in the waterways relied on the high speed outboard engines to ease their escape. It would be recalled that in January, after the pipeline explosion of Jan. 14 and 15, the ban on the use of high capacity boat engines was reiterated by the headquarters of the Joint Task Force,” he said. Tasiu said that the ban had been in force since 2007/2008 in the heat of the Niger Delta crisis. ”The reasons why this is being enforced now is that recently, the crimes in the Warri waterways have been crude oil theft, hijacking of vessels and other boats. “We also have issues of pipeline vandalism and these criminals use these high speed boats to perpetrate these crimes,” he said.